Somewhere around the seventh century a small band of Saxons settled in the area we now know as Smithy Garage. The leader was possibly called Eadwulf and the place where he settled could have been known as Eadulvington. Over the years this has become Adlington. The Legh family came to Adlington in 1315 and still live in the Hall to this day. 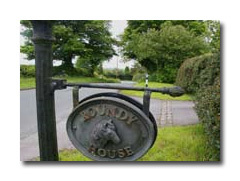 The Adlington Estate was then formed by fencing parcels of land and building farm houses and buildings for farm stock. One big farm in Whiteley Green is believed to have been the home of Thomas Pickford a timber merchant in Manchester who later made a fortune carting stone to London from the Goyt Valley. He or some of his descendents also lived at Woodlands and of course the firm of Pickfords is well known today. Cottages were built for farmworkers ,gamekeepers and some of the outdoor Hall staff. Agriculture was of course the main industry and all the farms would be tenants of the Hall. The farms have over the years not changed much until the 21st century. Since 2000 the main industry seems to be horses. Early in the history there were no roads only tracks. Perhaps the exception was Street Lane This was the main route to Buxton from Stockport and was most likely made in Roman Times. Footpaths were formed by workers going from home to work. Later more roads were formed and the Squire would be responsible for maintaining them. He was also responsible for Law and order "Overseers" were appointed to look after Parish Business. Central Government took over in 1835 and passed the Highways Act giving them responsibility. In 1892 the village wanted a Church so they bought a Flat Pack and erected it at the top of Brookledge Lane. The Parish Council was formed in 1894 when a meeting was held in Whiteley Green School (now a private house between the Middlewood Way and the canal in Holehouse Lane) to form a council. The council used to meet in the three schools that served the area in the 1800s, Whiteley Green, Wood Lane West (now a private house known as School House) and Butley School at the western end of Mill Lane. The present School was opened in 1909 and council meetings have been held from 1909 to 2005. The Parish Council now meets in the Village Hall in Mill Lane. 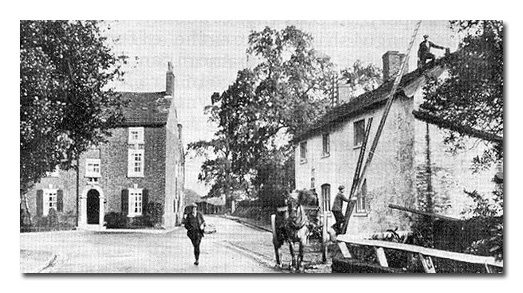 Today we have three pubs but if some Adlington Folk of the 18th century came back they would not know them. The three small shops have gone and so have the two Post Offices. The LNER railway line has become the Middlewood Way for walkers. The quarries which which exported "Styperson Blue" all over the world are now disused. There are only 2 farms producing milk. The farms have been split up into small areas to keep horses and there are two large stables. In addition the Macclesfield Canal and Middlewood Way offer several leisure activities such as walking, cycling. horse riding, boating and fishing.